(TibetanReview.net, Aug21, 2014) –The number of Tibetans who died after Chinese paramilitary police opened fire on Aug 12 on a peaceful protest by hundreds of them, calling for the release of their respected village head in the eastern Tibetan county of Sershul (Chinese Shiqu) in Kardze (Ganzi) Prefecture, Sichuan Province, has risen to five after the authorities delivered three bodies to a family on Aug 18. The trio, belonging to one family, have been named as Tsewang Gonpo, 60; Yeshe, 42; and Jinpa Tharchin, 18. Tsewang Gonpo was an uncle of Wangdak whose detention in the night of Oct 11-12 provoked the Tibetan protest which in turn led to the brutal Chinese response. Yeshe and Jinpa Tharchin were said to be a brother and a brother-in-law respectively of Wangdak. It was not clear when or how the three died. Available reports say the authorities denied medical care to the at least 10 Tibetans who were seriously injured, including with multiple bullet injuries. One report said the three died due to torture by Chinese police. It was earlier reported that a man named Lo Palsang had committed suicide on Aug 17 to protest against continuing torture by the Chinese police while another detainee, a 22-year-old man, died from injuries on the same day. During the protest by the Shugpa Village residents in front of the Loshu (Luoxu) Township government offices, the paramilitary police fired teargas shells and live ammunition into the crowd. The brutal crackdown led many people to flee into the nearby hills while all those who remained behind were rounded up, with the result that only the very old and those aged below 12-13 years old remained in the village which has a population of around 700. The detained were said to have been interrogated and tortured, irrespective of their age or involvement in the protest. As of now, at least 25 Tibetans are said to be still in detention. They include the detained village leader’s son Kunga Sherab who, lying wounded with bullet injuries, was reported to be in critical condition. The detainees also include monks, including one named Karma Rinchen, a meditation instructor at the local Miru Monastery, as well as Wangchen, Wangdak’s deputy in Shugpa Village. 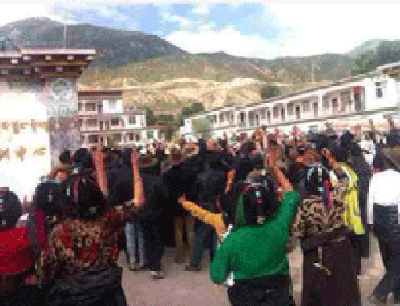 Wangdak, 45-year-old leader of Denma Shugpa Village, was taken away at midnight of Aug 11-12 after he had complained to the authorities about the harassment of Tibetan women by senior Chinese officials during a cultural performance which the local community had been forced to host during their visit to the county. But rather than listening to their complaints, the authorities called in security forces to disperse the crowd. Wangdak had voiced strong objection to the senior Chinese officials’ ill-treatment of Tibetan women during the cultural show, resulting in a verbal altercation. Enraged Chinese officials then accused Wangdak of having held an illegal ceremony at the beginning of a traditional local horse-racing festival, which included an incense-burning ritual and prayer offerings. Wangdak was the chairman of the Denma Horse Festival Committee which organized the event. The authorities are now said to falsely accuse Wangdak at forced public meetings of having embezzled public funds as an apparent preparation to put him on trial.